Christmas is just around the corner why not book yourself into a Christmas Dance party. Get in the groove and get dancing this Christmas. There are all kinds of dancing parties, from rock and roll, swing dancing, salsa, tango and ballroom. No partner? No problem, Christmas dance parties are a great way to meet new people, and make friends. Its the season of goodwill what better time to make new connections? If your new to dance you can even get some lessons in before Christmas! Dance teachers and schools are taking bookings for pre-Christmas dancing lessons. So, why not book your pre-Christmas classes so your in the swing for the festive period. Get Your glad rags on. What better time to celebrate and get your glad rags on, dress the part and dance the night away. Party themes range from Black Tie to Toga parties, Afro Caribbean new year fiesta.. its what ever you want. Dance parties are for everyone.. no matter what level its a time to celebrate. Its a social thing as well as dancing. Dance in the New Year with your partner or make new friends. 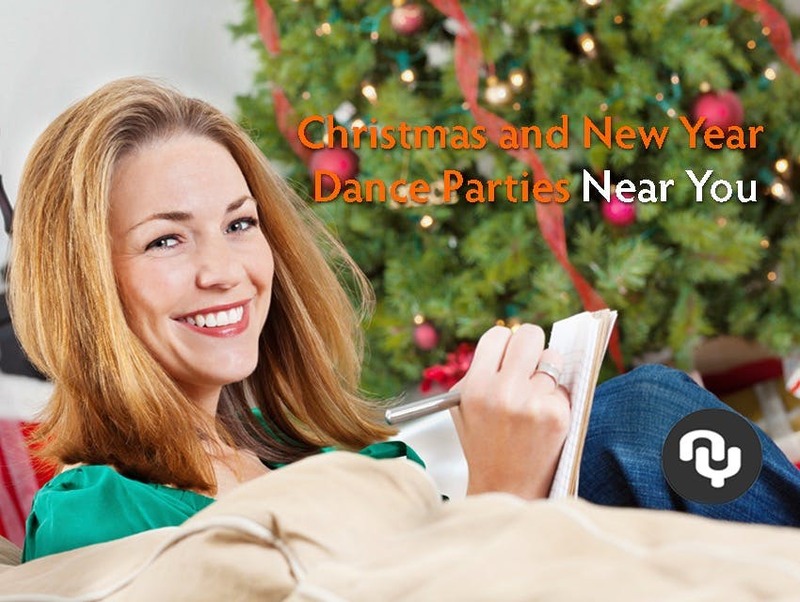 Here is our selection of top Christmas and New Year Dance parties on Dance Near You. These parties are popular so you need to book in advance. Don't wait for the day or you maybe disappointed. Some are offering early booking discounts if you move fast then you can score a good deal. Live in Bedford? Swingsters are running a Rockin' Around the Xmas Tree dance party on 22nd December. Get your glad rags on as we are going to Rockin' Around the Xmas Tree with Live Music from The Roustabouts, plus complimentary snacks! Great value only £12.72 per person so it wont break the bank and you will have a great time. Bedford Christmas party book here. Plus Swingsters are also running a New Years Eve extravaganza featuring live music with The Devil's Cut Combo band. A great band, great authentic with an infectious 50's R'nB beat of hot early, Rockin' Blues and Boogie Woogie. This news years event in Bedford is hot so book now £47.70, don't wait and Book Now. Dewsbury based dance studio Absolute Ballroom is very popular with Dance Near You customers. They are running an event on the 24th December. A great way to celebrate Christmas Eve. Buffet included and music all night long. Absolute Ballroom are also running a New Year's Eve party in Dewsbury on the 31st December only £32.75 this will sell out very quickly so you should book early to reserve a place for you and your partner. Reserve here. Norwich Salsa Lovers join Chilli Con Salsa's New Years Eve Toga Party will be perfect for you. Find a Toga and celebrate New Year Eve with friends and family and welcome in 2019. The party package includes a welcome Bellini cocktail or mocktail, delicious canapés, Greek snacks, our best party DJ, a glass of Prosecco at midnight and much more! They have a limited number of tickets available at just £12. This is great value but act fast because the price will be rise to £15 so grab yours now. Book here. Londoners could this be the most romantic dance event in the city? What could be more romantic that dancing in the New Year with Raquel Greenberg's Milonga Party in her beautiful dance studio La Divina in Marylebone Central, London. Its going to be a glittering night suitable for Tango lovers. No need for partner, just turn up and tango, tango, tango into the New Year! Ticket availability is limited, you should book your ticket in advance online to secure your place for just £31.80 per person here. Book here. Christmas is best time of the year to jump on the dance floor and learn the authentic Tango. Plus join Raquel Greenberg Dance Academy's special Christmas 4 day beginners course where you can go from zero to hero. Tickets are limited book your place online only £40 for 4 hours. Book this Tango crash course now. ﻿﻿﻿Dance-Cubana in Leicester would love the opportunity to celebrate with you at one of their Christmas Parties. Come and join Dance-Cubana Friday December 14 for their first Christmas party and a great night of dancing. Plus grab your tinsel, Santa hats, and dance shoes and join them the 22nd in Desford, Leicester for the last party of the year with a festive theme! Fulham based Princeps Dance Academy are waiting for YOU! Four instructors, the best tunes in town and hot moves! Pump up your energy and fun factor! Burn all those mince pies and still party. This will be a one different Zumba class - be prepared for memorable and Book Here. If you live in Epsom you must join the BALLIAMO'S CHRISTMAS PARTY. Horton golf course, with food, champagne on arrival, social dancing and dance demonstrations from the British Champion Leila Stewart. If you don't want to miss the show, Book Here a reservation. This is just a small selection of great Christmas and New Years Even parties. View all dancing events here.